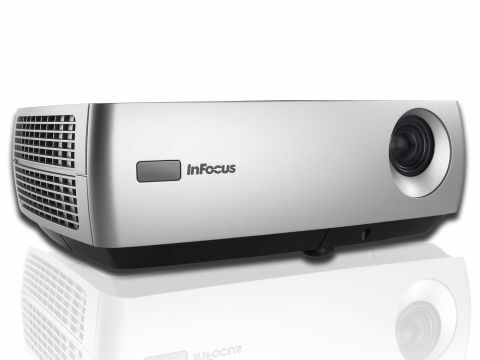 The InFocus IN26 plus is an amended version of the IN26 which has the brightness rating boosted from 1700 to 2200 ANSI lumens. The styling is very boxy, with a flat top that has the 12 control buttons set into the surface and vented panels on both the left and right-hand sides. The styling isn't offensive by any means, but neither does it seem especially sophisticated. Take the remote control, for instance; it's relatively large and runs on two AA batteries, yet it only has six buttons and could clearly have been made far more compact. When it comes to connecting your laptop, there's a VGA input, for which you get a cable, and also a VGA output, but no DVI. The mains cable in the package had a European plug rather than a British three-pin. You can also use an S-Video or composite connection, although InFocus doesn't supply the appropriate cables, and the audio connection uses stereo RCA plugs, which isn't the sort of thing you find on a laptop. With the projector running there's no ignoring the noise of the cooling fan, as it makes an intrusive whining noise. The level is rated at 35dB which is loud by any standards. We found image quality acceptable. However, the brightness and contrast adjustments are a bit crude and the presets are feeble. Presentation mode is bright and harsh, but does the job, while the two movie modes are rather dark and very similar to each other, so we think you'll struggle if you want to look at photos or coloured content. Image quality is average, although the resolution is higher; however, the noise from the cooling fan is worse and, to our mind, unacceptable.